There is a phenomenon when looking at the sun set on the ocean horizon with no clouds and little moisture in the air, called the green flash. It happens as the sun disappears behind the blue sea and we both saw it clearly on Wednesday. It was very cool. We are currently at the 5Fs in farmer’s cay, the first Friday in February Farmer’s Cay Festival. 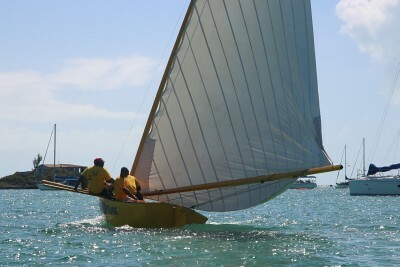 The main event is racing the c class Bahamian sloops. The boats are small racing dinghies with a big sail extending past the boat. It takes 3 big men sitting way out on a board (pry) to balance all the sail. They line up for the start with the sails down and the boats at anchor. When the signal is given, the sails are raised and the anchor pulled simultaneously. The course is long with a number of turns which are determined as the boats travel. Really interesting racing. The other events were men’s best legs and bums as well as the women’s wet tshirt contest. We missed all of those. Weather is in the low 80’s with a light breeze. There are over a 100 boats in the anchorage and at night their anchor lights look like a little city. We’re still having a good time. I know for a fact the seeing the green flash is directly related to the amount of rum consumed! No extra drinking that day! We hear you are coming down. We had a great souse on Calypso last night!